Hello there! 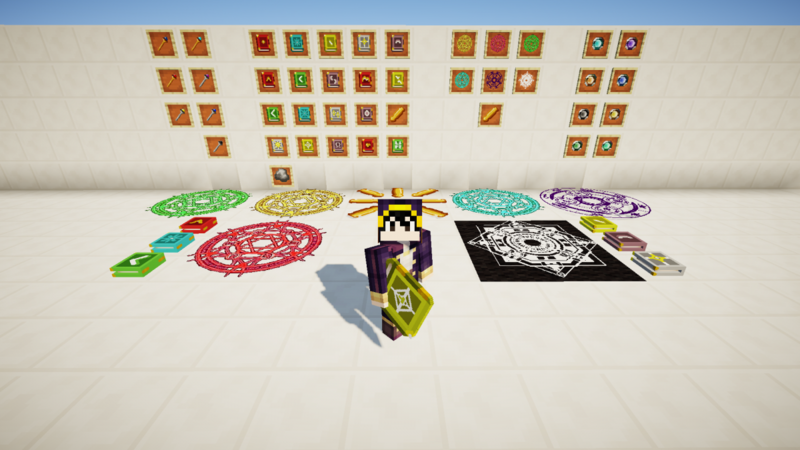 this is my very first mod, I made it because I Feel like minecraft needs another type of magic aside potions and enchantments. 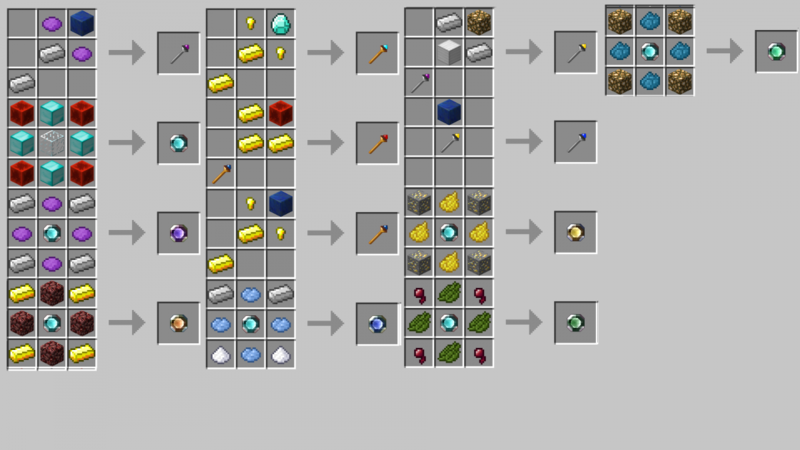 There are 32 total items in the mod, 22 tomes, 8 charms and 6 staves. The items itself are self-explanatory. Anima magic or nature magic is a magic category: one of three primary types of offensive magic. This magical discipline is centered around communion with and mastery of the forces of nature itself, is chiefly associated with Mages and Sages, and its structure and approach to spell-casting is described as being elegant and refined with a sense of freedom to it. There are four types of anima magic: Fire, Ice, Wind and Electric, each with its own strenghts and flaws. Light magic is a magic category: one of three primary types of offensive magic.The practice of light magic is described as being derived from religion and the divine, and as a result in most cases the majority of wielders of light magic are of the clergy.Light magic in general have the most wide range of the other two diciplines, and is the most acurate. The scroll magic is an extension of light magic, this is an alternative for al those diviners.Scrolls summon ancient spirits to attack enemies, with the animals of the first ten earth branches of the Chinese Zodiac forming the main hierarchy. Scrolls take the form of long, thin pieces of wood with magic symbols inscribed onto them, and are bundled in groups of four or eight. Dark Magic, also known as "elder magic" is a magic category: one of three primary types of offensive magic.Dark magic is a manifestation of knowledge of overall. Dark magic in general possesses the highest might of the magic types, offset by being the least accurate. Additionally, dark tomes are frequently distinguished from other magic types by possessing additional, unusual effects alongside just dealing damage. Staff (Plural: Staves) magic its the only that its only for support.Staves are unique in that they have no capacity to actively deal damage and cannot be used to attack, nor in most cases defend an attack. Instead, they deal entirely in support magic to aid the caster or non-violently cripple their enemies. Staves are used to grant (potion) effects to the caster, or control few aspects of the nature, it'll break. Festales are used to reverse some effects present in the nature, much like desertification, or it can even control the time, it wont break. Also charm magic is an extension of staff magic, providing many effects to the caster. Sometimes I may select someone to add an Regalia Tome/Staff, you can participate by posting a comment. Tome is an archaic english term, that literaly means "book"
In the epic poem Nibelungenlied, Brynhildr, or Brünnhilde, is a valkyrie and the queen of Iceland. some tomes are included for now, in the future there will be more. 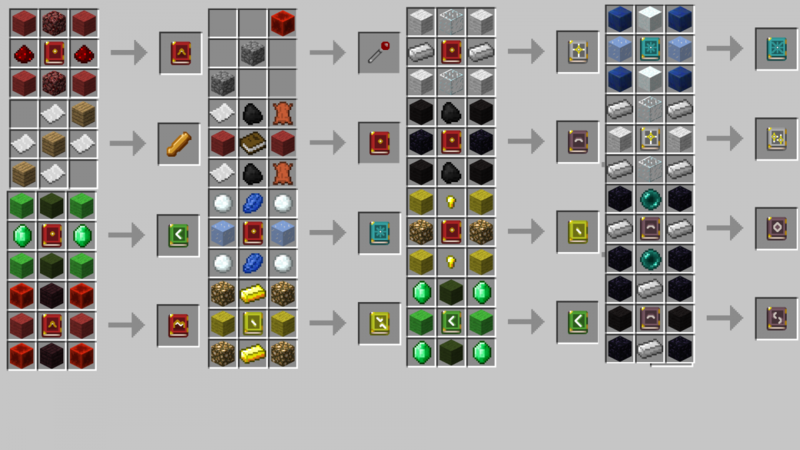 Added decorative tomes based on basic tomes. Added charms that add effects to the caster. Added advanced versions of staves. Interesting things you've got there. Keep working! I'll add one regalia for you too! It'll be in the next update. and one for you too! if you want to get your tome in survival, yes.